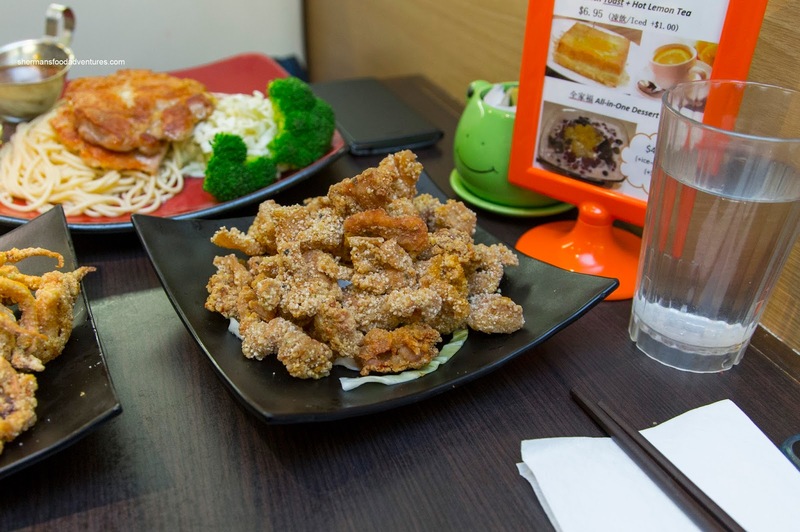 Sometimes it's easier said than done when selecting a restaurant for late night eats. Sure, there are actually a decent amount, especially in and around the Downtown core. However, it is a crap shoot everywhere else. Since it was only Milhouse, Bear and Lionel Hutz joining me for food, it meant we didn't need to head West (because all of us live either in Burnaby or East Van). 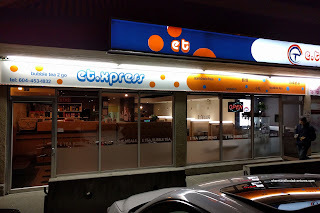 There was a brief thought about going to Golden Oscar, but since we still bore the scars of our last visit (it sucked), we decided to go kitty corner to E-Tea. We decided to share 2 items in the Chicken Nuggets and Deep-Fried Squid Tentacles. Sporting a light and crispy coating, the chicken nuggets were fairly succulent and tender. Although the skin remained attached, it was well-rendered and crunchy. We thought the flavour was decent with enough salt and light pepperiness. 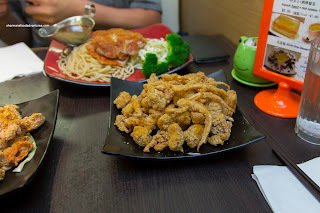 Universally, we weren't huge fans of the squid though as it was too chewy and somewhat fishy-tasting. On the other hand, the batter on the outside was crunchy and not greasy. It was a bit thick though and bready. For myself, I had the Hand Pulled Beef Noodle Soup. 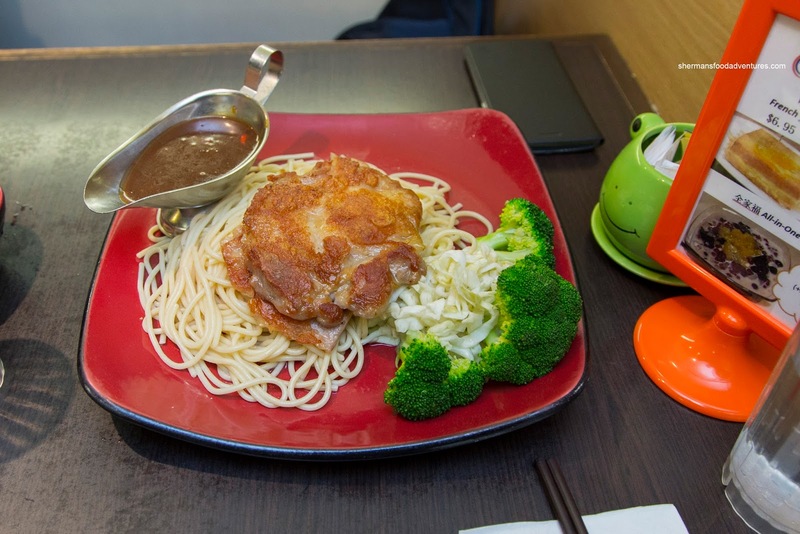 Okay, maybe I'm being picky here, but the noodles were too uniform to be hand pulled. With that being said, they were decent being slippery and chewy. 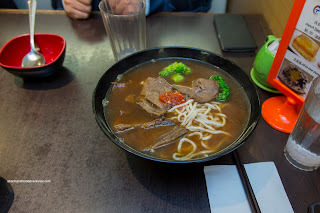 As for the broth, it was pretty weak as it tasted more like something you'd find with instant noodles. It was thin and had more MSG taste than beefiness. There was a slight spice due to the hot paste on top. I did like the beef shank though as it was super tender and moist. Bear did the predictable and had the Chicken Steak with black pepper sauce. The chicken was well-seared and succulent inside. We found the sauce to have a nice silky consistency while being peppery and spicy due to the addition of red chili peppers. Lionel Hutz ended up with the Thai Chicken Fried Rice that was glistening with oil. Due to that, there was enough wok heat and chewiness. 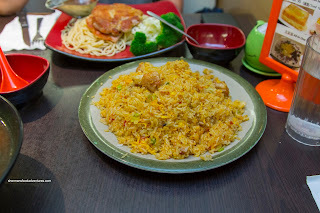 Beyond the on point texture of the rice, as well as the tender pieces of chicken, we found the flavour to be similar to a pad Thai. It was rather sweet with some savoury elements complimented by spice. For Milhouse, it was all about the Sweet and Sour Fish with rice. Good choice because the sauce was nicely thick and well-balanced. 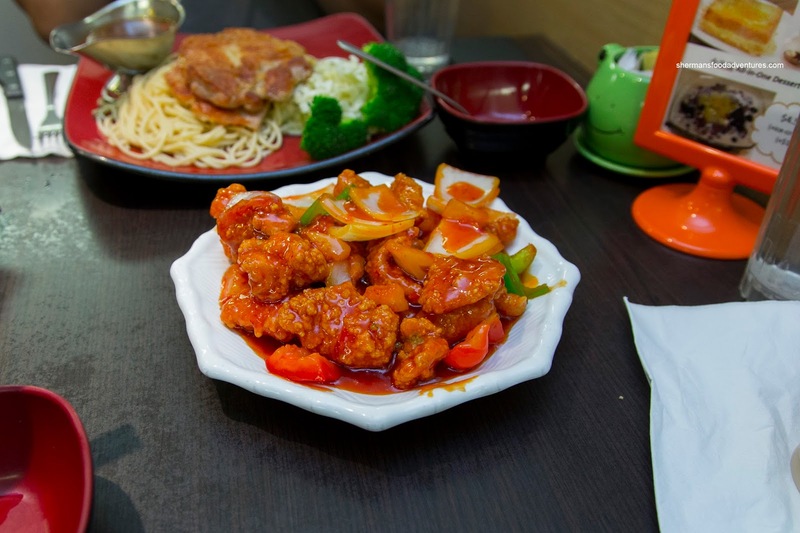 There were impactful hits of sweet and tang to go with a touch of spice. The fish was moist and flaky while sporting a crunchy exterior. 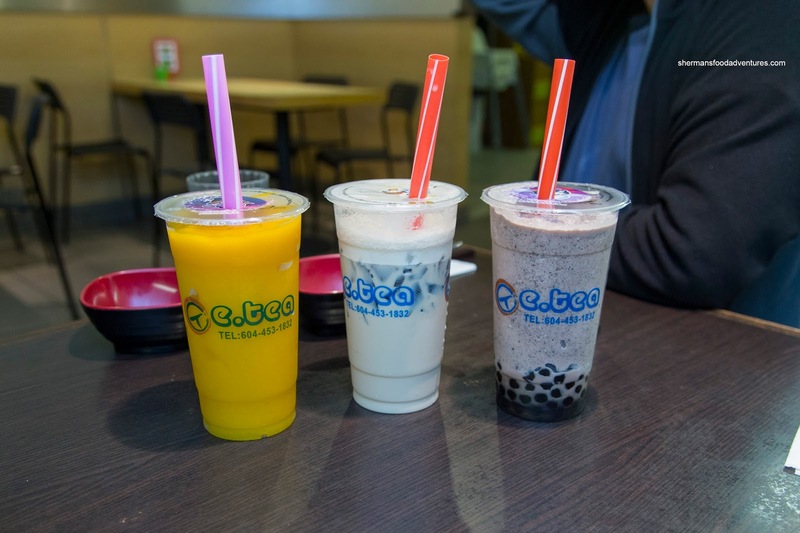 Of course we didn't leave out the Bubble Tea out of the equation since the place is a BBT joint. 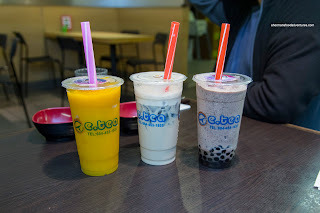 From left to right, we had the Mango, Milk Tea and Oreo. I thought all of them were okay and for those who didn't ask for half-sweet, like me, the drinks were a bit on the sweet side. I didn't think the flavours were overly memorable, but they weren't bland either. Definitely an acceptable option for late night. 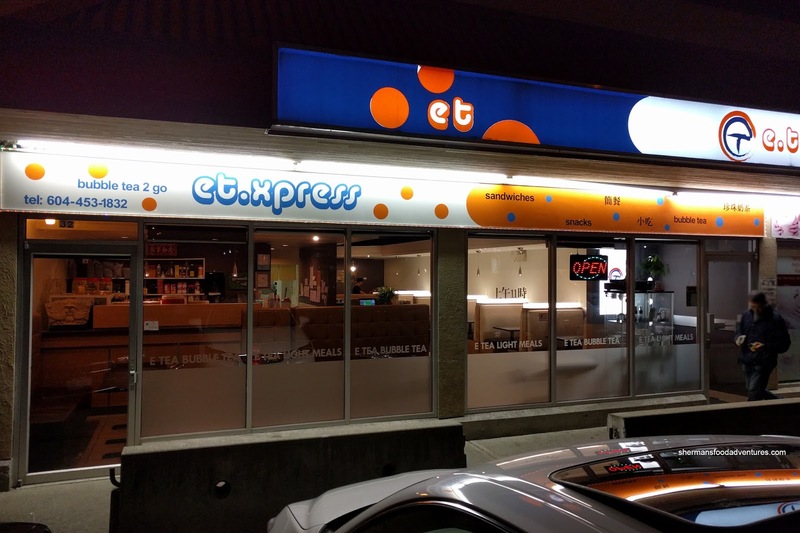 That pretty much sums up E-Tea as the food was alright except for the squid and noodles. Prices were pretty cheap though, which would somewhat offset some of their shortcomings.